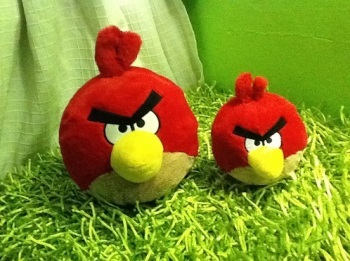 Rovio CEO Peter Vesterbacka says the rampant piracy of Angry Birds merchandise in China actually makes him happy. Piracy, as it applies to counterfeiting, copyright infringement and so forth, is not cool. It not only deprives content creators of income, it can also hinder future projects [just ask any PC gamer about that] and can lead to some pretty gross overreactions from companies determined to protect their work. [Just ask any PC gamer about that.] But despite the runaway piracy of Angry Birds merchandise in China, Vesterbacka is determined to focus on the upside. "There are a lot of Angry Birds products out there, but most of them aren't officially licensed," he said at the Disrupt conference in Beijing. "The way we look at it is, of course we want to sell the officially licensed, good quality products, but at the same time we have to be happy about the fact that the brand is so loved that it is the most copied brand in China," he continued. "It's great for us to see the demand, and that's why we're building our own stores here. And actually we're building our first stores here, and not in Helsinki... We hope to have quite a few over the next 12 months." There's no overlooking the fact that it's easy to be serene about counterfeit merchandise when your primary product is a runaway success, and Angry Birds is as much a phenomenon in China as it is everywhere else in the world. The game has been downloaded roughly 50 million times in China and Vesterbacka expects that number to double by the end of the year; global downloads are now pushing 500 million, making it "the fastest-growing brand ever," he said, outpacing heavyweights like Google, Facebook, YouTube and Skype. The Chinese market is still second to the U.S. is size, but Rovio intends to take advantage of the fact that it's growing much more quickly. "We actually expect to do a lot of services, a lot of products, here first," Vesterbacka said. "It's a different approach to some of our competitors. We want to be more Chinese than the Chinese companies."